This is a generic Band Module board and harmonic filter parts to use in conjunction with the SUPER Tuna transmitter. Kit includes the printed circuit board, toroids, capacitors, connectors, nylon screws & nuts, zero ohm jumper and magnet wire. The module is a generic 20m module.... so builder must either supply the crystal or purchase any 20m crystal separately from QRPme. 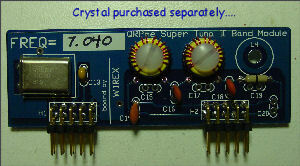 The full selection of crystals available from QRPme can be found in the parts pages.